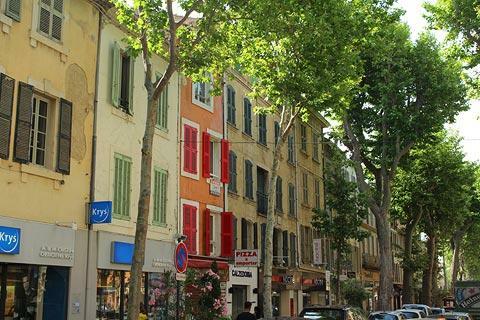 The market town of Salon-de-Provence is found in the centre of the Bouches-du-Rhone department of Provence, between Arles and Aix-en-Provence. Whichever direction you approach the town from you will be struck by the olive plantations that cover the surrounding hills and have formed the basis of the towns renowned olive oil industry for the last 600 years. 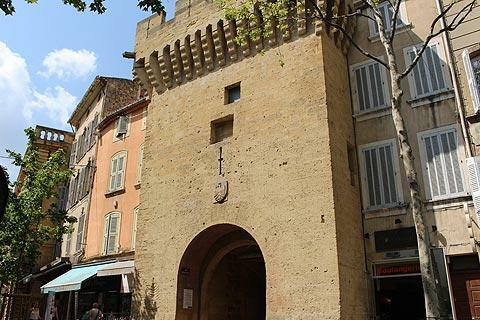 Salon-de-Provence has an attractive historical centre, accessed by one of the original gateways through the walls that once defended the town - the towers of Bourg-Neuf and the clocktower. 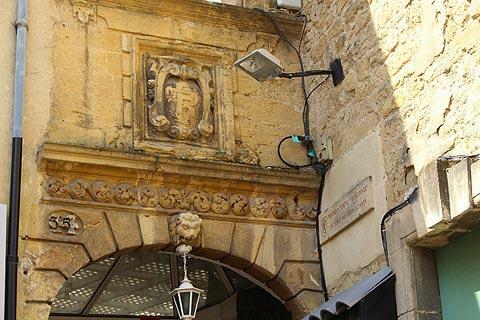 There are many medieval buildings to admire in the streets around the centre, and in the pretty open squares and several other small fountains. 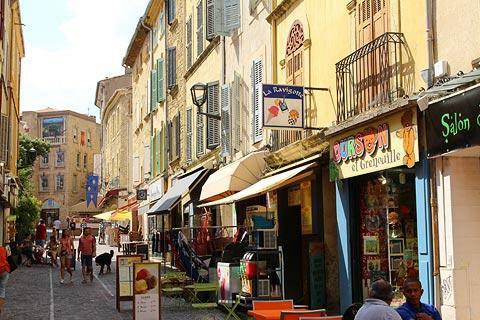 France This Way comment: Salon-de-Provence is smaller and has less attractions than famous nearby towns such as Avignon and Aix-en-Provence and as a result attracts fewer visitors, but it certainly merits a visit if you are exploring the region. The clocktower gateway (La Porte de l'Horloge) is interesting, built in the 17th century with a classical style design incorporating columns around the base, and topped by the clocktower itself and an intricate campanile. The sundials on the tower (there are two of them) represent astronomical information to do with the moon and planets. 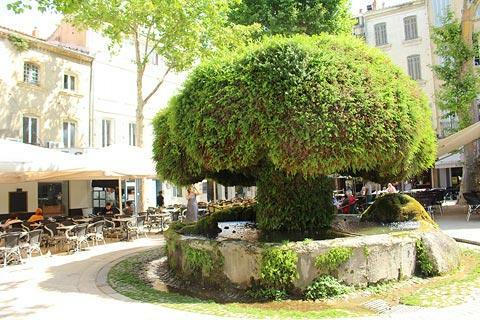 Just outside this gateway you can see the 'mossy fountain' which looks more like a stunted tree or a giant green toadstool than a fountain (more correctly known as La Grande Fontaine). 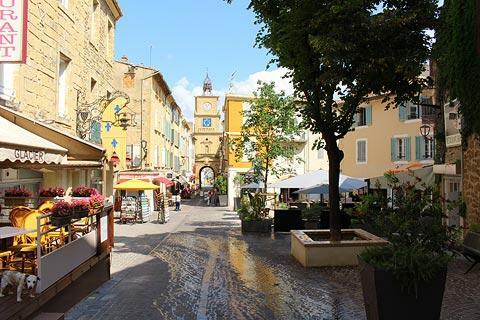 The main street in Salon-de-Provence is just inside this gateway, and is a charming pedestrian street with lots of cafes. 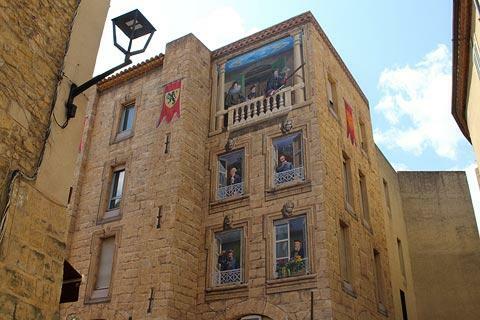 At the other end of the street there is a house that is painted with trompe l'oeil decoration representing stone walls and important characters from the history of the town including Adam Craponne and Nostradamus. This fresco was painted in 2016 to replace an earlier version that had become dilapidated. 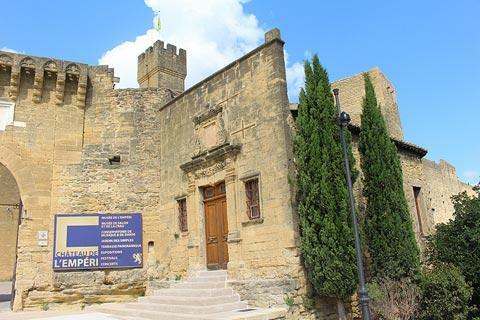 The main attraction in Salon-de-Provence is the Chateau de l'Emperi whose crenellated walls and tower stand poised above the surrounding streets at the top of a grand staircase. 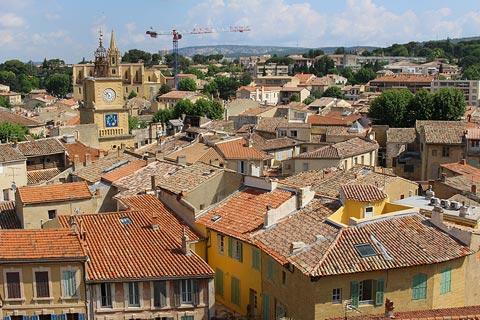 The castle dates its origins back to the 10th century (construction of the current castle was started in the 13th century) and was at one time the residence of the Arles' archbishops. The castle now contains a large military museum with numerous military related exhibits covering the period from the time of King Louis XIV to the First World War. 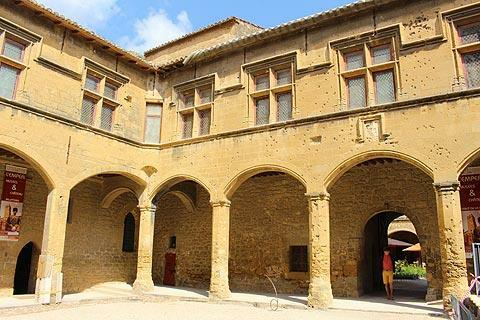 Even if you are not entering the museum you can enter to see an atractive courtyard surrounded by arcades and to see the lovely view across the town from the castle walls. 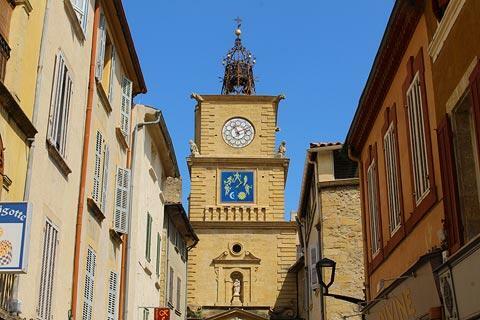 The Church of Saint-Michel is also here in the old town below the castle walls and dates from the 13th century (the clocktower was added in the 15th century) and is in the roman style. 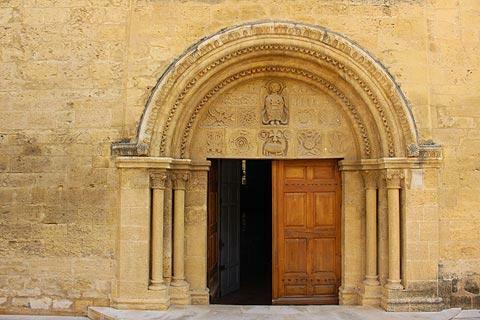 It is a charming church with arcades in the belltower, a historic campanile and an entrance surrounded by romanesque carvings. 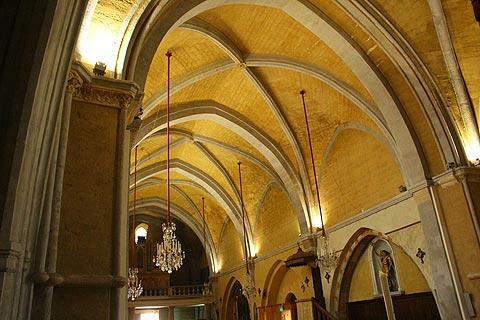 The golden yellow ceiling brings light and colour to the inside the church. 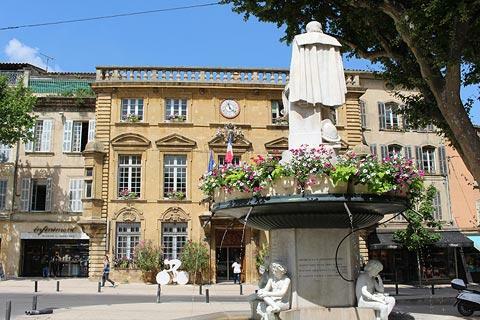 Another classical style building you will see in Salon-de-Provence is the Town Hall, just outside the city walls near the Porte Bourg-Neuf and with two statues standing above the entrance. Across the road from the town hall is a fountain, built in the 19th century to commemorate the 16th century engineer, Adam Craponne, who devised the method for providing irrigation to the region using a canal and enabling its agriculture to flourish. A statue of Craponne stands on top of the fountain. A more imposing religious monument, to the north of the centre of Salon-de-Provence, is the Collegiale Saint-Laurent, built over the course of 14th - 15th centuries onwards and incorporating both roman and gothic style elements. It is in this church that the renowned astrologer Nostradamus is buried. 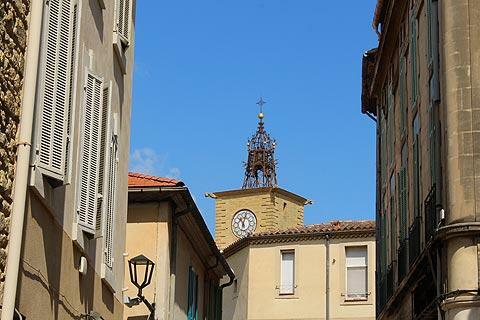 Within the town you can also visit a small museum dedicated to Nostradamus, fortune teller extraordinaire, who lived (and died) in Salon-de-Provence in the 16th century. 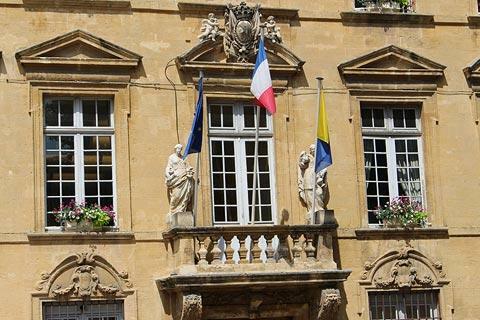 Outside the historical centre there is also a region of Salon-de-Provence that developed during the 19th century, in particular the region around the Villa Armieux which is now the Palace of Justice in the town. Several grand balconied 19th century townhouses can be seen here such as the Hotel Roche and the Hotel Couderc. The scenery of the Alpilles can be explored to the north-west of the town, with one of favourite provencal villages in the region at Baux-de-Provence. 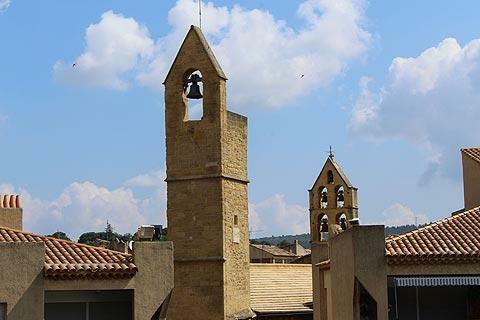 Some of the many picturesque villages of the Luberon such as Menerbes, Lacoste and Bonnieux are a little way to the north-east.